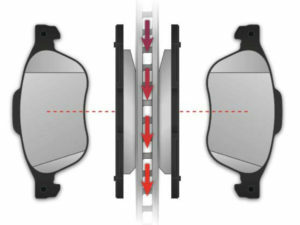 With the constant demand for improvement in all aspects of performance, vehicle manufacturers have designed brake pads for numerous applications that must be mounted directionally. Apec follow suit and offer pads that match the OE, in line with specification and performance. The main reason for directional brake pads is to eliminate noise. NB: Failure to fit the pads correctly could result in noise and poor performance. If there is an arrow present on the back of the pad, then it should always face in the direction of disc rotation. If no arrow is present, then please observe the following scenarios. chamfers are present, then the large chamfer should oppose disc rotation. 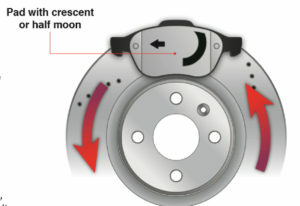 The crescent or half-moon should oppose disc rotation.